Tempranillo is the most cultivated grape in Spain. It is also known as the grape for 1,000 wines, because it produces very different wines in the different regions. Tempranillo means “early” because it has a quick maturation and therefore an “early” harvest. It is also known as tinta del pais, centible, tinta de Toro, ull de llebre, vid de Aranda, escobera or tinto fino (among other). There are signs of cultivation of tempranillo since the Phoenicians times in Spain. In Valdepenas, this was the local grape with distinctive characteristics. 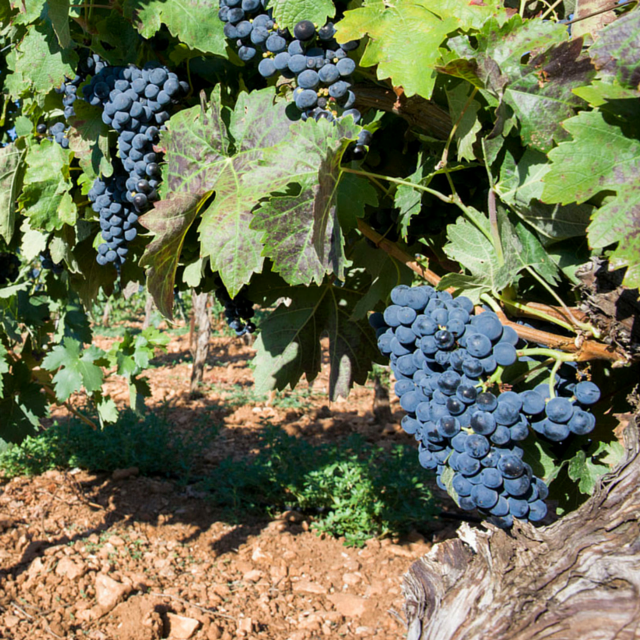 In other regions like La Mancha or Rioja, tempranillo is also the most popular red grape. It is a sensitive and delicate grape that suffered a lot from the philosere plague in the 19th century. Tempranillo grapes have thick skin of a black- dark blue colour. The average altitude of the tempranillo vineyards is quite high. It adapts to droughts, extreme weather and high summer temperatures. In fact, the best tempranillo are located in very sunny areas with a big difference of temperature sbetween day and night. Tempranillo can be found in Murcia, Navarra, Pais Vasco, La Rioja, Comunidad Valenciana , Cataluña, Extremadura, Madrid, Aragón, Castilla-La Mancha and Castilla y Leon. Outside Spain, tempranillo is very important in wine producing in Portugal, Argentina, Chile, Peru, Mexico and Australia. Wines made of tempranillo can be enjoyed without any oak aging, but it is usual to find also oaked wines with intense ruby colous, wild berries aromas, prunes, tobacco, vanilla, spices and and flowers. Flavours are smooth, fine and velvety, with moderate acidity and medium intensity. Elegant is a good adjective for high quality tempranillo wines.